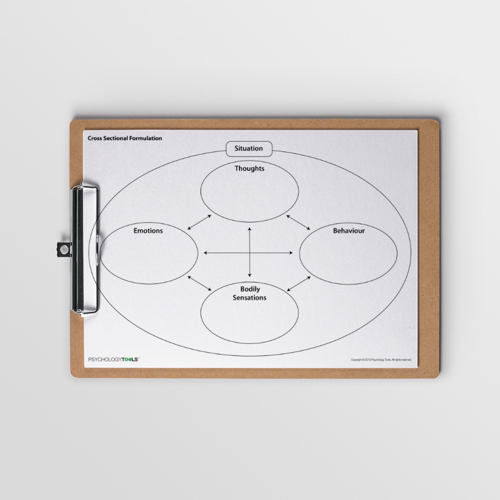 Case conceptualizations (formulations) help therapists and clients come to a shared understanding of a problem. This Cross Sectional Formulation explores the interactions between a situation, thoughts, emotions, body sensations and behaviors. The cross-sectional CBT formulation is sometimes called the ‘hot cross bun’ formulation. It is used to take a ‘snapshot’ of all the key aspects of the CBT model during a single event – like taking a cross-section of that event. 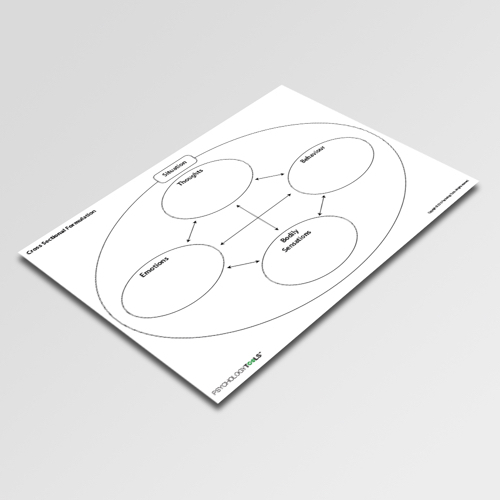 Using a model like this can be simple and helpful way of introducing the cognitive behavioral model to clients. It can help clients to understand and explore how thoughts, feelings, body sensations, and behaviors interact with one another. 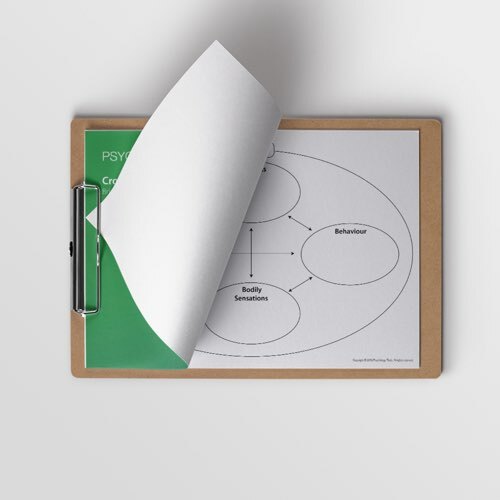 You can give it to clients as a prompt sheet to collect details of situations that occur in their lives. 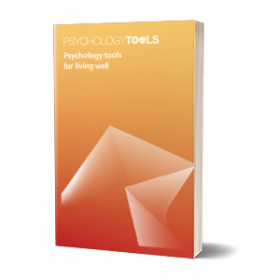 It can even be used to start to explore maintenance cycles – for example how certain types of thoughts might lead to body sensations which in turn lead to more thoughts. 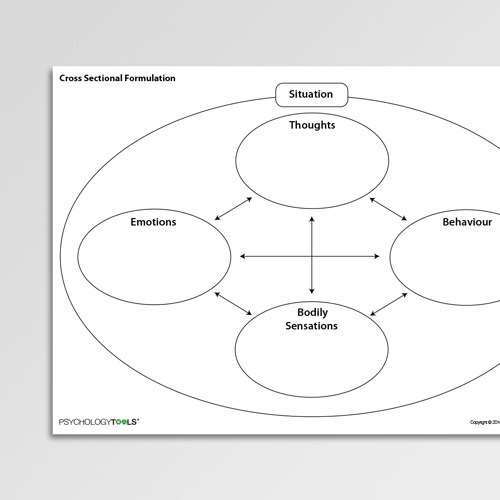 This is a Psychology Tools case formulation (case conceptualization) diagram. Put simply, case formulation is one method of a client and therapist coming to shared understanding of a difficulty. The formulation contextualizes the difficulty, making its origin and maintenance understandable. Case formulations are best completed collaboratively, with clients positioned as the ‘experts in themselves’. Cross-sectional CBT formulations are a great way of helping clients to understand the links between thoughts, emotions, behaviors, and body sensations. Once they understand the interlinking therapists can ask questions such as “If we want to have an effect upon the emotion, what would need to happen?”. Padesky, C. A., Mooney, K. A. (1990). Presenting the cognitive model to clients. International Cognitive Therapy Newsletter, 6, 13-14.